A wonderful way to relieve that holiday stress, these coloring canvases are fabulous unique Christmas gifts this holiday season. 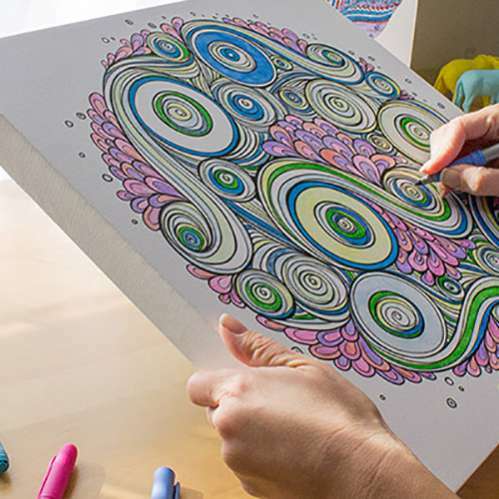 Relieve stress while creating art for your walls with a Coloring Canvas. Each piece is printed on high quality canvas and then mounted to a sturdy solid frame to ensure a comfortable surface for coloring that won’t bend or warp as you color. Coloring Canvases are printed on white canvas with black ink and are delivered to your door ready to color. We recommend using permanent markers on your Coloring Canvas. Designs range from beginner to advanced, so there’s a Coloring Canvas for everyone on your list! When your masterpiece is finished, use the included hardware to easily hang it on your wall and let the compliments pour in.